I might pass out from the beauty of this eBay find. 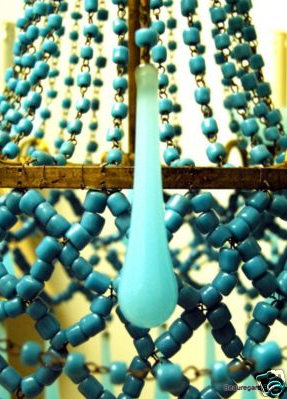 You know how I’ve started collection blue french opaline glasses in my pantry- check out this blue opaline chandelier! Imagine it hung IN THE PANTRY?!?! Could you just scream from the fabulousness?? OK, I’m cutting myself off. I think I’ve made 300 posts today. Time for some yoga. Ebay?? Oh my heavens I would LOVE that. You should buy that. It’s perfect. You may regret it forever if you don’t! Love this color! One of the colors I use to decorate my home. that chandelier really is great !! Oh, that chandelier is perfection! And what a perfect color too. A fabulous Ebay find – gorgeous! I have those glasses too. I found them on a recent thrift store trip. Oh my! It is perfect! and would look oh so lovely in your pantry! If this isn’t the one…there’ll be another! What a shame it’s so expensive because I agree – it would look absolutely phenominal in your pantry!!! WOW! Oh my God! I love it! Now could we get it for $370 not $3700!? The labels for your posts – they crack us up! Well instead of bidding on that I bid on and won three more opaline wine goblets so now I have a set of 8 and can use them for a dinner party! They will be so stunning with my china and some bright coral napkins! 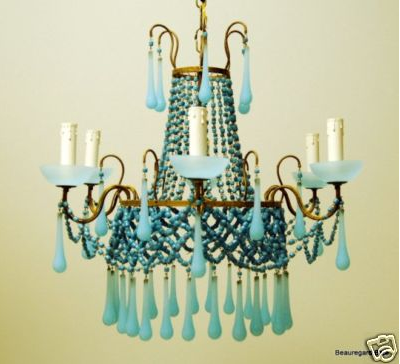 That chandlier is so beautiful! There has to be a place to find one less expensive?!? I think I know a shop in SF…I am going to hunt. Perfect for that kitchen area! OMG i am in love. why so much? need to less expensive version.